Here’s what is making news at POA. Surgeons of Peninsula Orthopaedic Associates delivered a strong leadership presence for cutting edge surgeon education and healthcare policy at the annual conference of the Maryland Orthopaedic Association (MOA) in Annapolis on February 9, 2019. Presentations to the statewide society of orthopaedic surgeons were led by Dr. Jason Scopp on Joint Preservation and Dr. Pasquale Petrera on Joint Replacement highlighting key state of the art advances in our practice to enhance surgeons’ education and patient care. Dr. Scott McGovern also addressed the future role of the society regarding education and healthcare policy as he was elected President of the MOA for 2019 following his six years serving on the Board of Directors. Dr. McGovern, President of the MOA, is pictured with past president, Dr. Robert Sterling. Following with the treatment recommendations established by the American Academy of Orthopaedic Surgeons, Peninsula Orthopaedic Associates (POA) has adopted the clinical practice guidelines for the treatment of osteoarthritis of the knee. These guidelines exclude the use of visco-supplementation therapy as an effective treatment option. Our Physicians and staff are committed to providing you the highest quality, most effective current treatment options for your knee osteoarthritis. These may include physical therapy, bracing, nonsteroidal anti-inflammatory (NSAID) medications, weight loss and/or surgery. We look forward to continuing to serve your Orthopaedic care needs. If you have any questions regarding this information or next steps in your treatment, please do not hesitate to ask your POA Medical Team. Dr. Jason Scopp was recently honored by being awarded the “Best Rated Abstract” certificate of achievement by the International Regeneration & Joint Preservation Society (ICRS). 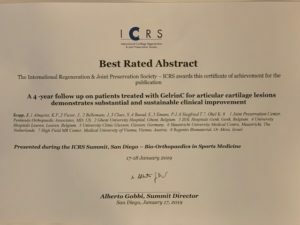 His publication “A 4-year follow up on patients treated with GelrinC for articular cartilage lesions demonstrates substantial and sustainable clinical improvement” led to his recognition during the annual ICRS Summit last week in San Diego, CA featuring bio-orthopaedics in sports medicine. 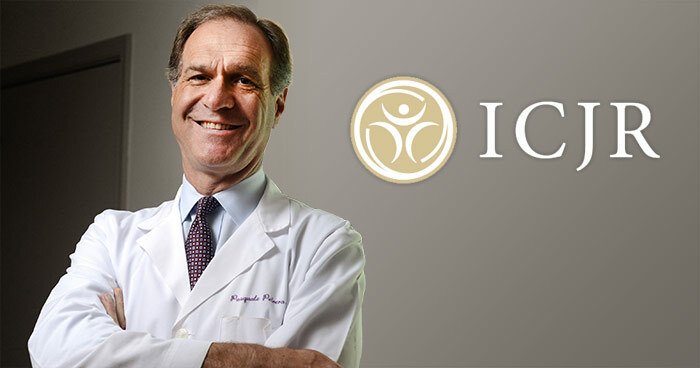 Dr. Petrera was recently honored by being asked to join a highly respected team of renowned surgeons from around the world as an invited faculty member for the International Congress for Joint Reconstruction’s 6th Annual Direct Anterior Approach Hip Conference. Over this three-day conference, Dr. Petrera and the other faculty members on this international team of highly-regarded orthopaedic surgeons presented, lectured, lead panel discussions and provided hands on instruction to help other orthopaedic surgeons from around the world further hone their knowledge base and skills for performing the direct anterior approach hip procedure. The anterior approach for total hip replacement is a tissue-sparing surgical alternative to traditional hip replacement that typically offers patients a faster recovery, less post-surgical pain, and improved mobility related to the minimized trauma to the surrounding areas provided by the procedure. 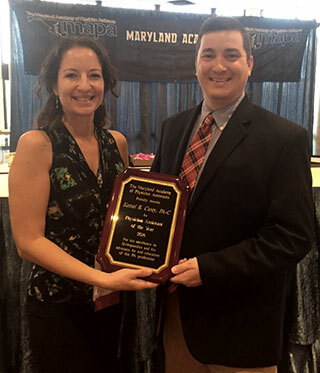 POA is proud to announce that the Maryland Academy of Physicians Assistants (MAPA) named Kemuel Carey, MHS, PA-C, ATC, as the 2016 Physician Assistant of the Year at their annual conference in Ocean City, Maryland. Each year, MAPA recognizes one individual for their exceptional leadership and skill as a Physician Assistant (PA). 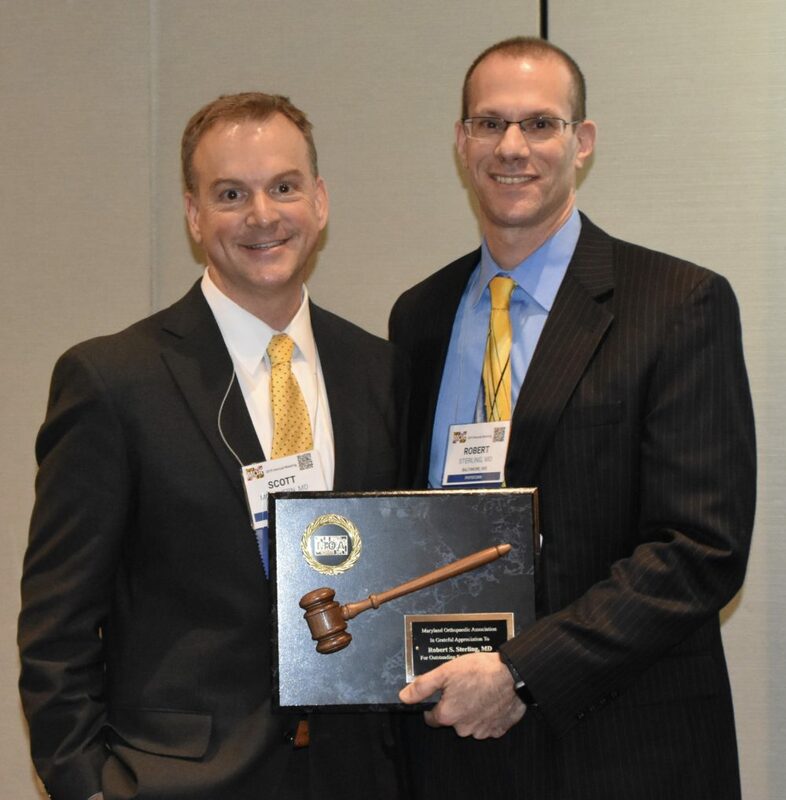 This year, the prestigious award was given to Carey for his unwavering dedication to his patients, his advocacy for the PA profession and his commitment to his community. According to Carey, “A great PA is one who focuses on providing excellent patient care and is engaged within a team of health care professionals. He/she is empathetic and seeks the best health care solution for each patient – treating each patient as if he/she was a family member.” This has been and continues to be Carey’s goal each day at POA. In addition to this award, the American Academy of Physician Assistants named Carey as a distinguished fellow. For the past four years, he has served on the MAPA Legislative and Reimbursement Committees and is also a member of the Advance Practice Professional Committee at Peninsula Regional Medical Center. He was also appointed as Liaison from the American Association of Physician Assistants (AAPA) to the American Academy of Orthopedic Surgeons and has served in that role since 2013. In addition, he currently serves as Secretary for the Board of Directors of Physician Assistants in Orthopaedic Surgery – a national specialty organization of the AAPA. Even at an early age, Carey was intrigued by medicine. He has spent his life seeking more training and education in his field, in order to provide exceptional patient care. This December, Carey will graduate with an MBA with a concentration in Health Care Administration. Please join us in congratulating Kemuel Carey on this outstanding accomplishment and honor. Join us in congratulating Kemuel Carey on his recent recognition by the American Association of Physician Assistants as a Distinguished Fellow. This national honor is awarded to PAs who have demonstrated dedication to their profession in at least three of these areas: medical practice, research, education or management; leadership; professional involvement; a commitment to lifelong learning and community service. This is an honor that reflects Kemuel’s commitment to his patients, community and to our entire POA team. This year over 7,000 voters participated in Coastal Style magazine’s fourth annual, “Best Of Wicomico County’s” readers’ poll naming us their “Top Docs” for Orthopaedics. Our entire staff is honored to have received this recognition as it reinforces the passion our practice has for providing the highest level of orthopeadic care for our patients and the region. We also congratulate the other “Top Docs” on this list for their continued dedication to the communities we serve – the communities we call home. Peninsular Regional Medical Center orthopedic surgeons and staff work on a patient at a hospital in Nicaragua in early June. All the cultural and practical differences between the small Hispanic country and the United States when it came to practicing medicine were on display. Surgical equipment was sterilized in the same small sink filled with green liquid, similar to what you would expect at a barber shop. Records were kept on typewriters. The air conditioning would only work in the operating room, and only some of the time. According to fellow orthopedic surgeon James Trauger, they reused medical supplies, scrubs and wardrobes that would never see the outside of a garbage can after their first use in America. It was Trauger’s third trip to the region, having first gone in July 2011. During his time at the hospital, he noticed equipment and supplies he brought down during his first trip were still in use by doctors at the hospital. “I took several tourniquets down three years ago. [One] tourniquet they had down there had been used on a lot of patients, and it was the same tourniquet from three years ago,” Trauger said. On the plus side, Trauger added that some instances of materials being used again would actually help cut down on the waste hospitals typically produce here in the states, specifically when it comes to washing up before going into surgery. “Here when we scrub, every single surgeon gets an individual peel pack and plastic is wasted. You scrub your hands with a sponge on one side and scrubbing bristles on the other, and it goes in the trash. So you do eight cases a day. That’s eight sponges, eight things of plastic that go into a landfill,” said Trauger. “There, there’s a huge bucket of stuff that probably lasts four months, and every surgeon comes up and they hit it with their elbow, put some soap in their hands, wash their hands. There’s no scrub brush, no plastic thrown out. You wash your hands off with water and you go into the room,” he added. 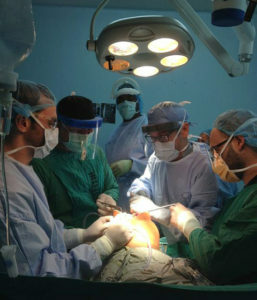 But while he and several other surgeons squeezed into the hospital’s small operating room to perform around eight hip and knee replacements a day, he and Petrera started to notice a difference in the level of excitement and involvement in medicine from younger resident doctors. “Here in the United States, they can’t get the kind of experience they got there,” said Petrera. “[They] all sewed, all assisted in surgery, all scrubbed in. And we watched them. It’s not a free-for-all.” “They were intimately involved in the surgery, which gives them a leg up over kids here in this country who think they want to be doctors but have never been in on a case,” added Petrera. “You do not have that opportunity here.” Trauger went on to describe how doctors in the country are chosen by their academic ability by the end of high school, with the top 1 percent going on to medical school immediately after graduating. In combination with the open nature of the hospital, with students in training as young as 18 years old sitting in on surgeries, it further illuminated for Trauger how regulated teaching medicine and surgery is in the United States. “The roadblocks, there are no roadblocks there. You can bring someone into your operating room, you can teach them what you do and information can be disseminated,” Trauger said. “For a surgeon to learn how to do something, he cannot look at it and know how to do it. They have to see it and feel it.” He said he envied how a program like this can exist and have surgeons freely teach other surgeons new techniques, something that’s not nearly as easy here in the states. “If reason could stand, medicine would be so much better. Every surgeon would be able to learn from every other surgeons and there wouldn’t be such a disparity in the care you get, I don’t think,” added Trauger.